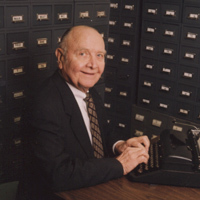 The Evansville Press made a joint donation of its archives to the Evansville Vanderburgh Public Library and to Willard Library after the newspaper ceased publication with the December 31, 1998, issue. Indexing of newspaper clippings is a work in progress. Added to the Press clippings is the lifetime work of Charles Browning. His two monumental biographical works, People of Evansville in World War II, about 40,000 cards, and his People Study, about 537,000 cards, are now online for the first time. They compliment Dr. Browning's other online work, the Browning Genealogy Database. COPYRIGHT NOTICE: This data may be used by non-commercial entities. These electronic pages cannot be reproduced in any format for profit or other gain. Copying of the information within by non-commercial individuals and libraries in encouraged. Any other use, including publication, storage in a retrieval system, or transmission by electronic, mechanical, or other means requires the written approval of the database owner.